Now I've tried before the scrumptious dim sum buffet at Dorsett Grand Subang last year (Emperor Grand Dorsett Subang Dim Sum Buffet) so I was delighted to get the chance to sample their Sunday Family Dim Sum Brunch last weekend. This round it was a tad different, where I went along with my mother, Janice and baby Martin. Price RM60++ per adult and RM30++ per child below 12 years old. For Mums and Dads who are with their children, there's this new Kid's Corner available with staffs to handle your kids while you dine. Fun activities such as sand art craft, colouring, games, cartoon channels, and even clown entertainment were available much to the child's delight. Baby Martin is still too young to enjoy the kids corner yet though, maybe next time. Anyway check out below on what we had that morning. 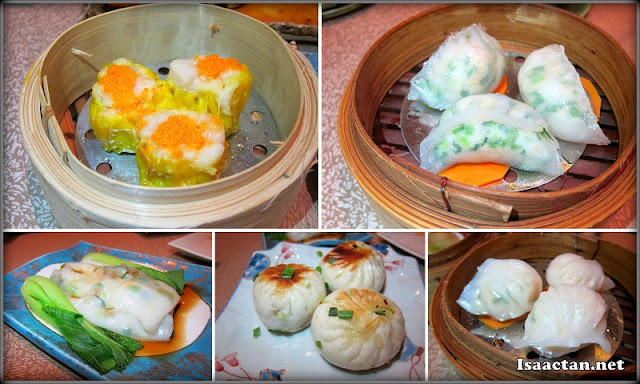 Touted to be one of the top choices for buffet Dim Sum in the city on Sundays and not to forget public holidays, there were a wide variety of steamed dim sum dishes to cater for all the dim sum lovers out there. I personally liked the Steamed "Siew Mai" Emperor style on top of the other delicacies. 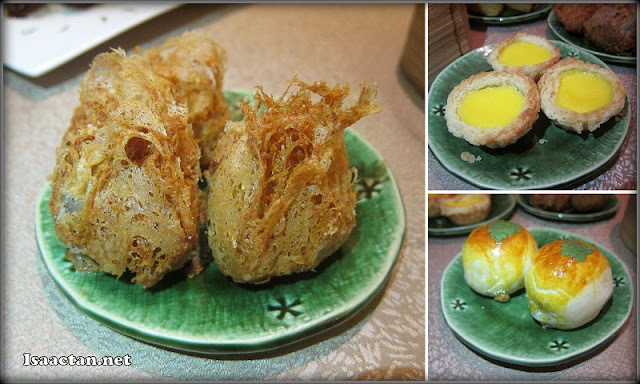 Deep Fried Yam Puff, Egg Tarts, and more .. There was just so many to choose from that morning. From Sui Kows, to deep-fried prawn rolls, baked mini egg tart custard, chicken barbecue paos to various meat dumplings, my stomach was stuffed from all the good stuff. The ingredients used were rather fresh, as I had no complaints about the taste. It was good to note the variety available, which caters for all. Even those who do not fancy too much dim sums, we could choose from The Emperor's house specialties ranging from cold starters, chinese barbecue stall, soups, live station stalls and also refreshing fruits and desserts. Check out the pictures below, and tell me if it is pleasing to the eyes. Trust me, it was good for the tastebuds. I'm really fussy when it comes to the "fishy" taste of seafood, but glad to say, the prawns and the deep fried fish had no fishiness to it. Same goes to the Stir Fried Tiger Prawns, which had lots of meat to it. If you came to this buffet with an empty stomach, these main dishes are a welcome sight. We ended the fine morning brunch with some desserts comprising of chilled longan with sea coconut syrup, red bean soup, chilled mango pudding, and lots of assorted french pastries and cakes. It was a good dim sum buffet brunch, one which was halal and held The Emperor Dorsett Grand Subang. Do check them out for some good dim sum buffet if you're up for it. Bring the kids, you'll be at ease letting them play in the kids corner while you dine. Ahhhhh!!!! This is the one where you met Merryn & son. Sundsy, hmmmm.....not convenient to go. yummmmm! the chinese BBQ meat looks yummy! Ethan really loves the Kid's Corner. He doesn't want to leave!!! Looks good...but RM60++!!! * faints* Next time I go KL, you belanja me dim sum there, can? Hehehehehe!!! !